Make the jump through the Kessel Run! Imagine launching into hyperspace with this 21-inch long Kessel Run Millennium Falcon, featuring hyperdrive light effects, sounds, and vibrations inspired by the iconic vehicle’s legendary jump through the famously dangerous Kessel Run! When kids wear their Force Link 2.0 wearable technology and pick up the 3.75-inch-included Han Solo figure (sold separately), they can activate character sounds and phrases, or pick up the Millennium Falcon escape craft to hear flying sound effects! When hyperdrive is activated, kids can blast off the panels of the vehicle to imagine Han Solo jumping the Kessel Run space route in less than 12 parsecs! Bring the galaxy to life with Force Link 2.0! Recreate the adventures of a galaxy far, far away with Force Link 2.0, featuring Bluetooth technology that allows for interactive social play within the world of Star Wars! Wear Force Link 2.0 wearable technology (available in Starter Set. Sold separately) to activate sounds and phrases in Force Link 2.0-activated figures, accessories, vehicles, and playsets! With Force Link 2.0, kids can team up with their friends to bring their favorite Star Wars adventures to life! 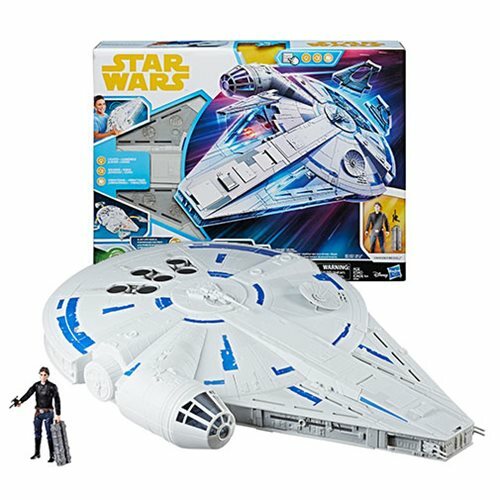 Includes vehicle, Han Solo figure, accessory, and instructions.